Square Hanging Sign Personalized with Your Words - - 2 sided 16" x 16" square hanging sign for professional offices, retail businesses, and homes. Double sided address plaque holds up to six lines of Your Words custom text and/or the logo or other artwork you supply. Made in the USA. 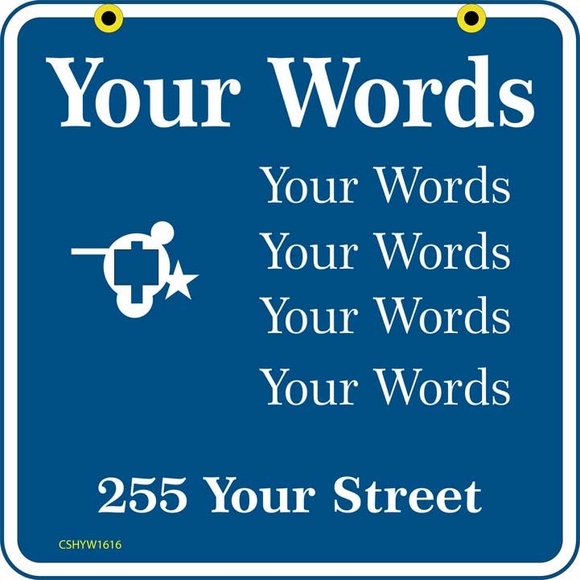 Your Words address signage has plenty of room for a complex address or information you want your patients, customers, clients, prospects, delivery drivers, and guests to see. Displays the same personalization on both sides. Each line holds up to eighteen (18) 1" high characters, ten (10) 2" characters, or a combination of line lengths/character sizes; and an optional logo or image that you supply. Character count includes spaces and punctuation. There is an additional charge for adding a logo or image. After placing your order, please send an email to customerservice@comforthouse.com with your layout, artwork, and order number. We will then send a quotation to add the artwork. If you do not have artwork, we will be happy to see if we have something suitable in our image library for you. 3/8" hanging holes on 10" centers are reinforced with two solid brass grommets. Ready to hang from your bracket and post. Made from sturdy, UV-stabilized laminated acrylic with engraved personalization. Dimensions: 16"W x 16"H x 1/8". Colors: sky blue with white characters, black with white characters, or white with black characters. Laminated acrylic address plaques made in America by skilled artisans to assure the highest quality.